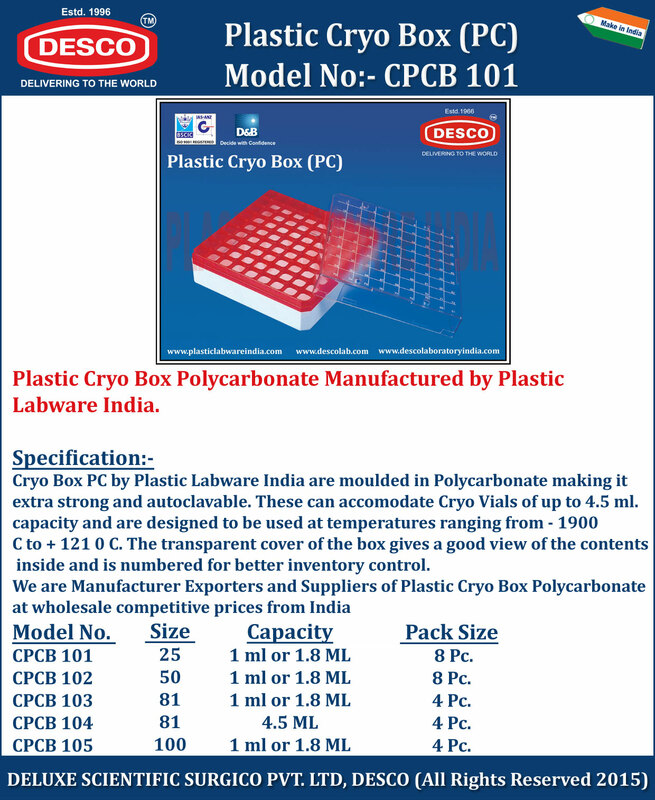 Cryo Box PC by Plastic Labware India are moulded in Polycarbonate making it extra strong and autoclavable. These can accomodate Cryo Vials of up to 4.5 ml. capacity and are designed to be used at temperatures ranging from - 1900 C to + 121 0 C.
The transparent cover of the box gives a good view of the contents inside and is numbered for better inventory control. We are Manufacturer Exporters and Suppliers of Plastic Cryo Box Polycarbonate at wholesale competitive prices from India. CPCB 101 25 1 ml or 1.8 ML 8 Pc. CPCB 102 50 1 ml or 1.8 ML 8 Pc. CPCB 103 81 1 ml or 1.8 ML 4 Pc. CPCB 104 81 4.5 ML 4 Pc. CPCB 105 100 1 ml or 1.8 ML 4 Pc.